Out of frustration, Abeles picked up a camera and made a movie, her first, about the never-ending marathon in which we have inadvertently sponsored our children. 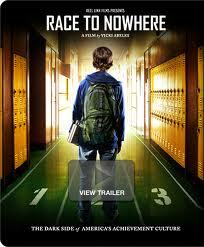 The resulting film, The Race to Nowhere, alternates between a cautionary tale and an overreaction to what happens when kids and parents are trapped by their own ambitions. There are no surprises in Abeles’ film. Dedicated teachers are thwarted by school boards. One exemplary English teacher felt so beleaguered by the Oakland, California school system that she left teaching altogether. The woman openly wept on camera about leaving her students to fend for themselves in a mediocre school system. The camera pans to a Stanford University freshman confessing that he regurgitated information for tests in high school only to be woefully unprepared for his freshman year of college. Then there are the befuddled parents and students who have no idea how to get off this exhausting treadmill. Fewer activities, an adjusted academic schedule? If only it were that easy. In the middle of all this angst is a heart-breaking interview with a mother whose 13 year-old daughter Devon committed suicide after getting a bad grade on a math test. I think back to a column I wrote about Amy Chua, the original tiger mom, wouldn’t accept anything less than an A from her daughters. The Tiger Mother roars and her cubs fall into line. And yet I have to believe that it was more than poor test results that tragically sent Devon over the edge. I worry about my children and the academic loads they carry. Anna was a three-season athlete in high school and often didn’t get to her homework until after dinner. Nothing annoyed her more than when I ask her how the homework situation is. She’d tell me the work is there and she would get through it no matter how long it took. Most nights I didn’t think she had an unreasonable amount of homework for a student as committed as she was. Yet I still fret about sleep-deprivation and the onslaught of emotional challenges she’s beginning to face as a college studentl. Sara Bennett is among those advocating education reform in Abeles’ film. She co-wrote a treatise with the self-explanatory title: The Case Against Homework. Like Abeles, she was a concerned parent who saw her children struggling against the overwhelming tide of worksheets and reading assignments in middle school. According to Bennett’s research, a child needs to do only 5 math problems to catch on to a concept. Tell that to Amy Chua whose older daughter was once bested in a math competition. Chua’s solution was to have her daughter complete 200 (no there is not an extra zero) math problems a night for 10 days. That’s 2000 problems. That’s a lot of math. That’s a long race. I wasn’t surprised to see Wendy Mogel make a cameo appearance to warn about the myriad ways our kids are stressed out. For Abeles and company, Mogel’s latest parenting book, The Blessings of a B-, is an island of calm in the madness of running after perfect SAT scores and padding resumes to resemble the CV of a Nobel prize-winner. As parents we all too often walk that tenuous line between encouraging our children to be their best and demanding perfection from them. What goes loudly unsaid throughout the film is that entrants in the “race to nowhere” are more often than not socioeconomically privileged. All I can say in the face of these tense times is to hug your kids often. Set a realistic course that takes them towards a fulfilling, healthy future because the alternatives are too upsetting to contemplate. This entry was posted in College, culture, education, family life, Parenting, parenting by judy bolton-fasman. Bookmark the permalink.